The What: PreSonus Audio Electronics has introduced the CDL-series loudspeakers, the latest additions to the company’s line of sound reinforcement designs. The What Else: The CDL12 Constant Directivity Loudspeaker is engineered to combine the best attributes of point-source and line array technology into a unique patent-pending design, radiating a highly focused pattern with consistent SPL throughout the frequency response range, both on- and off-axis. The companion subwoofer, the CDL18s, utilizes a ported design that maximizes efficiency to create a big bass sound from a compact cabinet. Both Dante-enabled powered enclosures can be flown as a vertical array, or combined for ground-stacked applications to create a complete, coherent loudspeaker system with an even response across the frequency spectrum. Each CDL12 consists of eight 2-inch drivers aligned in a segmented, circular-arc, high-frequency array centered in front of a 12-inch woofer. The output of the low-frequency driver travels from the same acoustic axis as the high-frequency array, so that the pattern always radiates from the center of the CDL12—whether used individually, or as part of an acoustically coupled vertical array with up to six enclosures. Because of this, the CDL12 avoids the near-field anomalies that can interfere with the sound quality of a traditional line array. This makes the CDL12 ideally suited for a broader range of venue sizes, creating a far-field response almost immediately as the sound is projected from the center of the enclosure. Thus, the controlled 120-degree horizontal coverage pattern is maintained while the vertical coverage is expanded by 20 degrees per box deployed. The result is a system that can be scaled from 20 to 120 degrees of vertical coverage, making the CDL12 well suited for array use. The CDL18s features a unique port configuration that maximizes efficiency to create big bass sound from a compact cabinet. Each of the four triangle-shaped ports is placed in a corner so that it couples to the cabinet, using the side walls to effectively elongate each port and allowing the CDL18s to move more air in a compact enclosure. Its custom 18-inch low-frequency transducer with 4-inch voice coil can travel 7mm before over-excursion, and handles 800W, providing the articulate low-end punch audio professionals demand. The CDL18s and CDL12 form a unique loudspeaker system ideal for both portable PA and installed sound applications. The Bottom Line: The CDL12’s hybrid point source/line array design combines the benefits of both technologies and delivers focused sound with consistent SPL. Furthermore, a low 420Hz crossover frequency minimizes comb filtering and doesn’t compete with conventional vocal range. 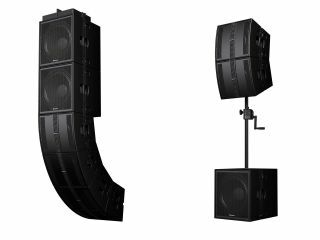 As a line array system for fixed installations, the ability to fly five enclosures under one or two companion CDL18s subwoofers provides considerable flexibility when addressing room size. The CDL12 includes an integrated 500W x 500W Class D power amplifier with onboard DSP presets. The loudspeaker’s support for Dante audio networking brings the benefits of IT networking to professional AV installations while providing full remote access for system tuning via PreSonus’ Worx Control software.